Visibility online is the whole presence of a brand or its products on the World Wide Web. A business can have an excellent website, but how are consumers expected to find it, if it’s not visible? Search traffic is highly important to any business. Online searchers are looking for what you have, provide, etc. But the foundation point starts with your business name. 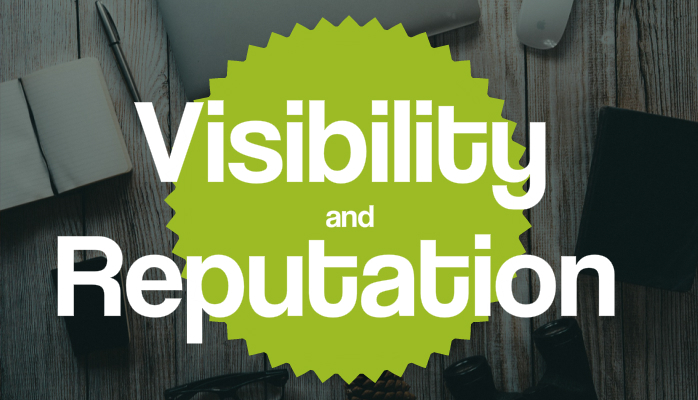 Business owners hold a slice of accountability when it comes to enriching online visibility. More and more individuals are jumping online to look for things they want. They are looking for more information, and if they find something that doesn’t push them to take action, then that’s a loss of business. How to improve online visibility? Unique visitors, or new daily visitors, are customers supporting your business. Online visibility assists with brand reputation, or how a business is perceived in the marketplace. Brand reputation helps a website stand out from its competition. There are a number of ways to improve your online visibility, but it all starts with the foundation of making sure your business can be found if someone is looking for you. And not just found on one website but many. Not everyone is going to search for you in Google, they may go to Facebook. So you want to make sure you’re covering as much “ground” as possible to make sure you’re always available to be seen on matter where someone goes online. Today more than ever, your online reputation has a direct effect on your business. 92% of online searchers are looking for reading reviews. You might as well say 100%! Reviews are swaying people’s next step with a business or product. There are some that even focus on reading the bad reviews just to see how the company is responding to them. Being proactive and going after generating Positive Reviews is key to keeping your business fresh and allowing it to promote for you. And when those Bad Reviews do appear, by continually generating Positive Reviews, you’ll be able to push the bad ones down. For more in-depth methods for creating a strong Online Presence and Reputation, contact us today for a free consultation.